By downloading software from the Mattic web site, you agree to the terms of the products license agreements. 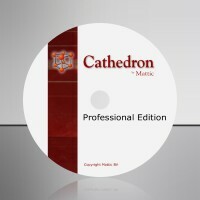 Cathedron performs a clean install and provides a standard uninstall (through 'control panel/add remove programs'). Cathedron will not create any registry keys and will only copy/create files in the installation folders. Don't want to read the manual? Try user 'dev' with password 'dev'. The manual is still based on the 1.0.22 release. In the 1.5 release the 'structure modeler' can be found as the 'information modeler' in the new design menu.